We are currently taking orders for the 2018 season. Growers are now preparing their orchards, and arranging their sales contracts. Harvest will run from mid Marchuntil early May. Chestnuts are a perishable product. Under the right refrigerated conditions, they should keep for at least six months without significant deterioration. 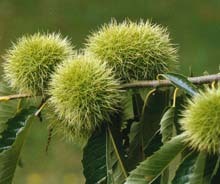 However, most growers will not hold chestnuts, without firm sales outlets. During the chestnut harvest season why not have relaxing afternoon at our orchard. Get out of the city! Pick Your Open chestnuts. Have a picnic, and simply relax. The harvest starts in mid-March, and runs for about 4 weeks. We are open Saturday and Sunday, plus the long Easter Weekend, 10am-4pm. Send you an email to get an update. Wholesalers: now to order fresh, chilled chestnuts. Chestnuts are delivered direct to your store or restaurant twice weekly. Our chestnuts are generally packed in either 10kg or 20kg 'netlon' (nylon net) bags, but other alternatives are possible, depending upon customer requirements. Consumers: If your local green grocer or supermarket does not stock chestnuts, Contact us now for details of our direct home delivery service. Generally export quantities of chestnuts are not stored without a reasonably firm commercial outlet. Contact us now to order fresh, chilled or frozen chestnuts. Our chestnuts are generally packed in 20kg 'netlon' (nylon net) bags, but other alternatives are possible, depending upon customer requirements. Nuts can be sea-freighted, either chilled or frozen, or air freighted chilled. A sea container will take 12 tonnes, an air container approx 1.2 tonnes. Whole, machine-peeled chestnuts selaed in a 500gm and 1 kg plastic bag. Kept frozen, this product will have a storage life in excess of 9 months. Contact us now to discuss your volume requirements. We are proud to represent a number of innovative New Zealand chestnut processors. The key products from their ranges are set out below. Contact us if the product you are seeking is not listed here - it may already be in the portfolio of one of our suppliers, or we will endeavour to get it made especially for you. The delicious taste of Chestnut Stuffing for poultry, pork or vegetarian dishes. Simply add water and a knob of butter to create a great stuffing for your chicken or turkey. Alternatively, can be used to create a basting for chicken or pork pieces. This is peeled, crumbed chestnut product produced in a factory in the heart of New Zealand's chestnut growing region. The product has a soft texture, with a delicate flavour, and the capacity to absorb a moderate amount of moisture. It is equally delicious in savoury as in sweet dishes, is quite exceptionally low in fat, and is totally gluten free. It is frozen and packed in 500gm resealable plastic bags, with a safe storage time of several months at least, and can be quickly thawed and used in a wide variety of domestic and production recipes. Other products are under active development. Contact us now to discuss your requirements.